It's been a while since I have put myself out there and gotten out of my comfort zone. It has also been a while since I have been out on my own on a Friday night! I used to meet new people all the time with work. I was always challenging myself in new situations and I felt at ease with small talk and meeting new people. It's funny how much things change. 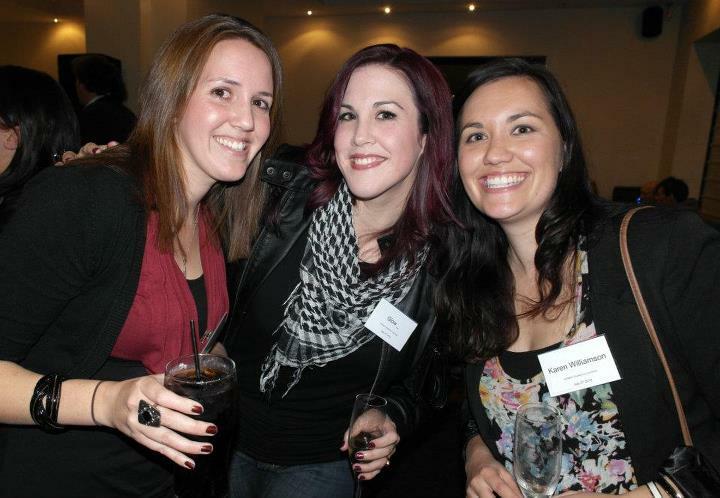 For the last year, apart from my awesome Mums group, I haven't really done much 'meeting' new folk, so when the opportunity came to attend a WOMBATS (Website and Online Media, Bloggers and Tweeps) Christmas in July Drinks, I jumped at the chance to meet other bloggers in Perth. As the day approached I started to get a little nervous, suddenly realising I would be turning up alone to a bar to meet a bunch of people I had never met and had only seen online and twitter (it felt oddly like some kind of strange online dating situation). I resisted the temptation to pull out at the last minute, and figured that the worst that would happen is that I would awkwardly stand by myself with a drink, and well that is not really that bad seeing I rarely get any time to myself these days, and even rarer with and alcoholic beverage. Looking at my smile, I must have been having a good time! How Huge is my mouth, seriously. I ended up having a really good night. I was maybe a little quieter and more reserved than normal, but that will change next time I'm sure! Not surprisingly everyone was so lovely, warm and welcoming. I had a glass of bubbly in my hand about a minute after arriving, and conversation very shortly after that. Thanks to Yvette, Colin (Associate Woman), Cie (Pathetic To Pinup) and Taryn (This is Taryn), I didn't have any awkward standing on my own moments. It was great to meet other Perth bloggers and feel part of a blogging community, I even got told I look like Yumi Stines, but less Asian (Thanks @RealJiveTurkey, I will take that as a compliment). 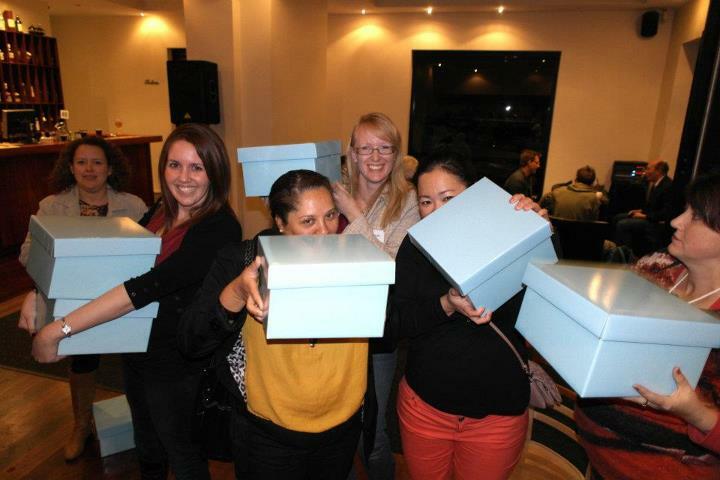 Everyone was very intrigued by what was in these boxes! As an added bonus we walked away with these amazing gift boxes, although I was extremely bitter and disappointed to find out my box was mysteriously missing the Macaroons. I guess my waistline can be Thankful for that, because I am pretty sure I would have devoured them all that night. 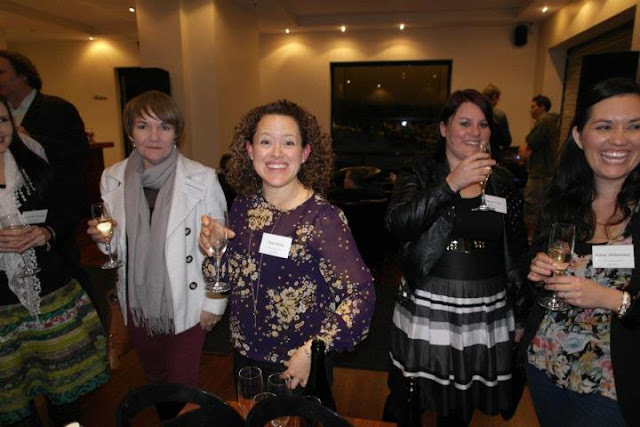 I didn't get the chance to meet everyone there, but some of the other lovely bloggers I met were Jules (The Bumpiest Path), Narelle (CookCleanCraft), Feli (My Life in Mono), Sarah (Dear Baby G), Chantel (Bossy Mummy) and Silly Mummy. I am looking forward to checking out all of their blogs! A big Thank You to the Wonderful Sponsors Bubbler Deals, Digital Parents & Nuffnang! I am looking forward to the next one, and maybe I won't drive this time so I can have a couple (or more) glasses of Red!! I didn't take any pictures at all that night, so these are all from the W.O.M.B.A.T Facebook page. 2 comments on "First Timer at a Blogger Event"
Yes another bubbly fueled event is definitely in order! Hopefully I won't have to drive this time! I saw you too, next time lets actually talk!! We have to do another meet-up...so that I can meet you! How awful am I! I remember seeing you, but never actually got to speak to you. So clearly this is justification for another bubbly-fueled event, yes?